Now that the whole rush to get ready for Norouz is over and done with, it’s time to think about what type of delicious dishes we need to prepare to take with us to the Sisdeh Bedar Picnic. I think that a dish that is very picnic friendly is Kuku. I have posted a variety of Kuku recipe on this website including Lima Bean & Dill Kuku, Squash Kuku, Kuku Sabzi, Zucchini Kuku, and Chicken Kuku. Today I introduce you to a new type of Kuku which is super delicious and easy to make. 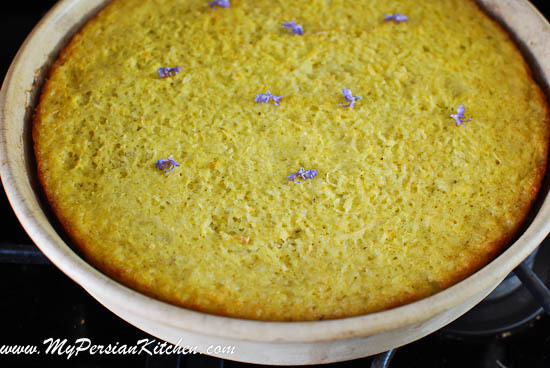 Let me begin by saying that there are a few different ways in which Iranians make this specific type of Kuku. So needless to say that this is the first recipe of a few more. 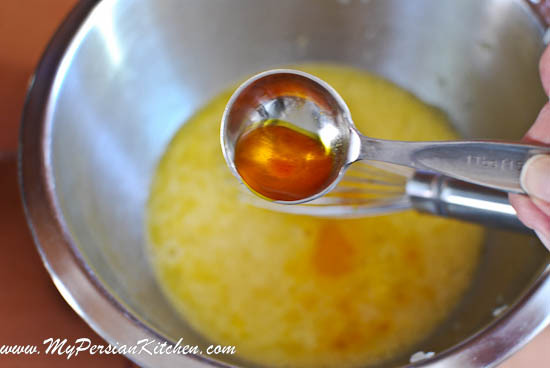 I have found that some people like to use Saffron while other swear by this recipe being made with Turmeric. Some people sauté their onion, some don’t. 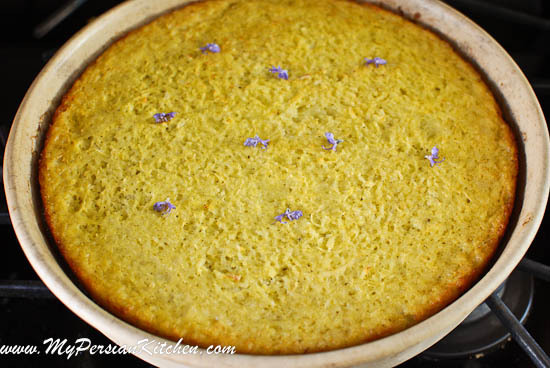 Today’s recipe is made with Saffron! Typically, this recipe is about 8 servings. If you are not cooking for that many people, but trust me, you’ll want to make the whole recipe because you’ll love the leftovers! 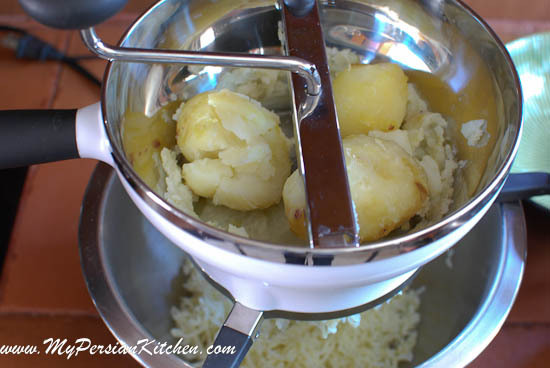 Boil potatoes until cooked. Then mash potatoes. Preferably use a Food Mill or a Potato Ricer for best result. Once done, allow potatoes to cool down. Grate onion in a bowl. 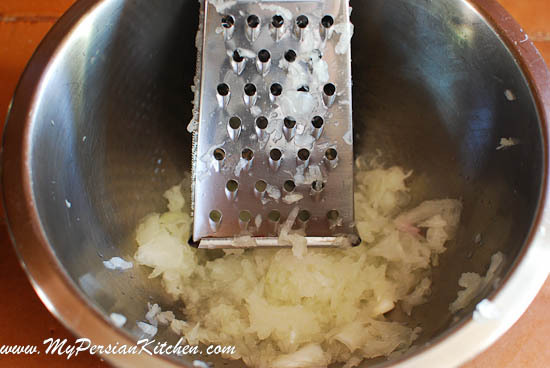 Add eggs, salt, pepper, and baking powder to grated onion. Beat together until well incorporated. Add brewed saffron and continue to beat. 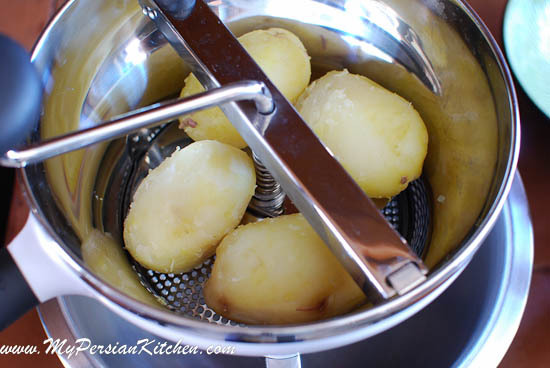 Add potatoes to the bowl and gently stir until everything is mixed together thoroughly. 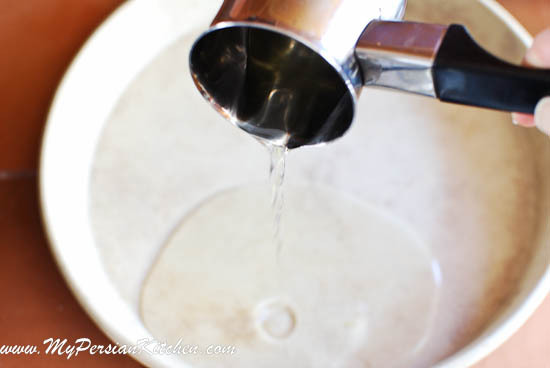 Warm up the vegetable oil until hot. 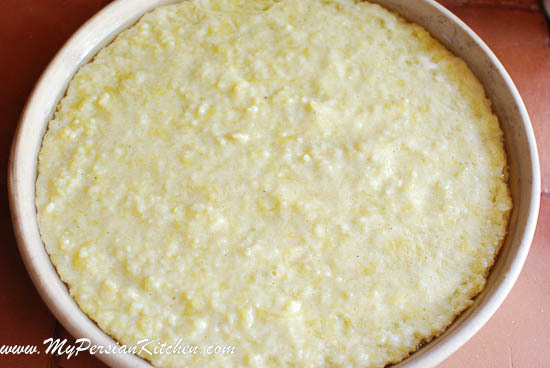 Pour in a baking dish making sure that all of the bottom surface is evenly covered with the oil. Add potato mixture. 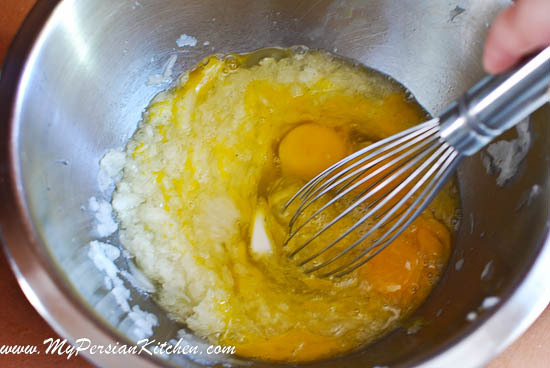 Shake baking dish slightly to make sure that the potato and egg mixture is evenly distributed all over the dish. Bake at 375° for 45 minutes or until cooked all they way through. I don’t like to further mash my potatoes when making this Kuku and like to leave them in the same shape as they come out of the food mill. I like the texture that the potatoes have and it visually looks nice to me. Mary, no kukus are usually served on their own as a side dish. I just discovered your website, and it’s superb! I was wondering if this potato kuku can be veganized ? Would an egg substitute work as a binder, or alternatively can the egg be left out? I know, leaving out eggs out of kuku is coocoo, but I thought I’d ask. Shaheen, good question. I have no idea as I have never tried an egg substitute. Try it and let me know! Dear Sanam , I would like to link your site to mine , If you dont mind ,of course . And you can also link my site to yours .Please inform me ,then I can add your site to the list . It would be a good source for English language Iranian or persian-food lovers , or even maybe good cooking lessons for those who are interested in English learning by Cooking ! I will wait for your response. have nice week and good luck my dear . Shabnam, thank you for your interest and feel free to link! This sounds delicious. As an Irish person, I am always seeking new ways to cook potatoes! Can the kuku be served cold or hot? Sadhbh, I’d serve it either hot or room temperature. I found out by accident that potato kuku tastes really good with ranch dressing. Really nice , quick and simple reciepe . I had never tried persion food. Will try this definately. Thank. Hi, I have wonderful Iranian friends and we’ve eaten beautifully prepared meals at their home several times. 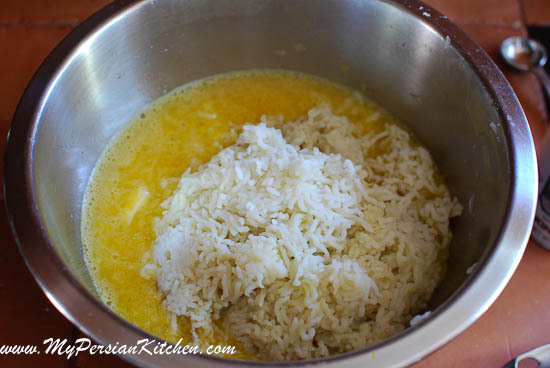 I thought I’d try the Persian Dill Rice myself. It’s so easy to prepare and tasted delicious. Love the Persian culture, people and cuisine. Thank you!!!! Sanam joon, your instructions were really clear, but I have a tendency to mess simple things up in the kitchen! Mine turned out really dry… and kind of squishy (rather than having a crust). Any advice?? Samera, I am baffled, how can it be dry and squishy??!! Hi this is Fauzia,I am trying your Potato KuKu right now hope it comes out well like yours:)please I will be greatful if you can even write for how many people this dish will be enough thanks.